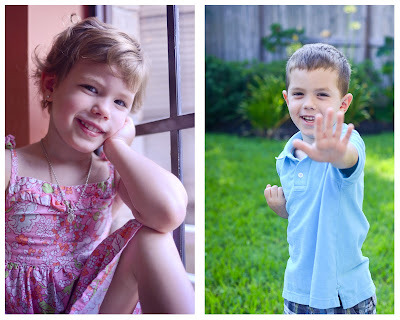 1st Day of Kindergarten & Pre-K3! Monday was Jackson's 1st day of kindergarten and Audrey's 1st day of Pre-K3!!! I apologize for the really long post, but this is a big deal!!! We've all been excited, nervous, and a little overwhelmed about reaching this milestone for Jackson. The transition really started about 3 weeks ago when we pulled Jackson out of his day care and sent him to a karate camp for 2 weeks at the place he is now doing after school care. There was a mixture of excitement and nervousness about making new friends and being in a new place when he went to camp, but the kids and the adults at Bushi Ban were amazing the first week. The second week we began to see some changes, both good and bad, and we realize the "transition" was happening in full force. With Jackson, transitions have always been a little rough, and this one has been no exception. Despite the challenges associated with change, having Jackson start this transition early has worked really well for him, and having a strong support system of encouraging friends has worked well for me! 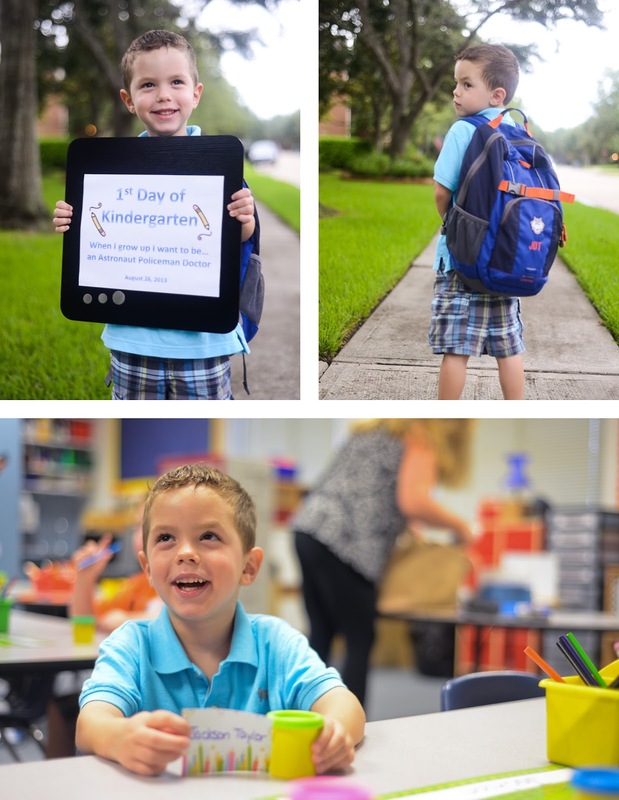 The first day of kindergarten, we decided we would take Jackson to school, but knowing he wanted to ride the bus, we thought it would be a good idea to meet some of the kids at the bus stop and see the process before he actually had to do it. This turned out to be both a great idea and a horrible idea all at the same time. Jackson was so excited about it he had a meltdown when we wouldn't let him get on the bus! In hind sight we probably should have just let him get on and met him at the school...not what we chose to do though. Fortunately, Ross was able to help him recover, and we managed to get some happy first day of school pictures! 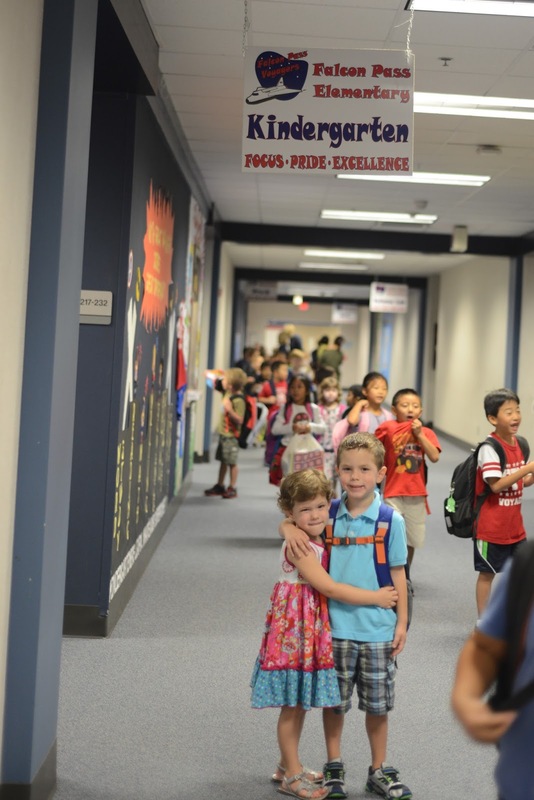 We got to the school before the doors were unlocked, and Jackson got to see several of his friends before walking in. When the doors were opened, he held Audrey's hand, walked her down the halls, and showed her where he would be. It was adorable! We left him sitting happily at his new table playing with playdough. In anticipation of Jackson's "transition behavior" I'd written his teacher a note, which turned out to be a good idea because I got a phone call that afternoon letting me know there had been a couple of challenging moments during the day, but overall he had a great first day! Each day this week got a little better, and by the end of the week, he had a smiley face with no note in his take home folder! He was greatly rewarded on Friday!!! Jackson has LOVED riding the bus in the mornings. There are around 10 kids at the bus stop every morning along with parents and 2 or 3 dogs. The bus driver seems amazing, and we've all enjoyed getting to know our neighbors a little better. When we picked Jackson up from Bushi Ban each day this week, he was grinning from ear to ear and having a blast. We even got to watch a couple of the karate classes and see how quickly he is learning there too. Early bedtimes (7 or 7:30) were part of our routine this week to try to help with all of the changes. Even though Jackson doesn't always nap anymore, he's still used to a rest time. Despite the early bed time giving him almost 12 hours of sleep, Jackson still had to be woken up to catch the bus some mornings! I was able to join Jackson for lunch on Friday, which was fun. He was SO excited to see me, and I loved getting to see him in his new environment. He got to invite a friend to eat with us at the parents' table, so I got to get to know his "best friend at this school," which made it clear he still has other best friends too. Audrey has done amazingly well with her transition to a new class at her school. She has been a little sad not to have her big brother in the car with her on the way to school or just down the hall to go visit, but she has dealt with it all really well! We've also enjoyed a little alone time with her each day. It's given us more time to get to hear about the things that are important to Audrey! Audrey has loved walking Jackson to the bus stop each morning, and now that we're also taking Bailey, she loves getting to be responsible for the leash. 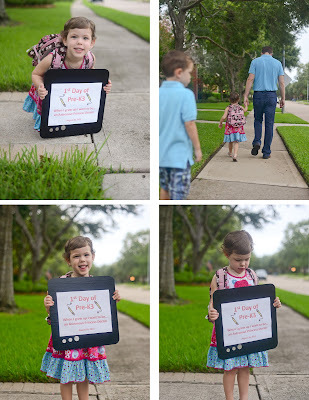 Here are her first day of school pics and one from our walk home from the bus stop the first morning...you can see Jackson is a little grumpy, but Audrey is happily leading the way. We're excited to have the first week behind us and enjoy a long weekend for Labor Day. I think it's going to be a great year! Last Friday was the end of the kids summer break. Audrey's school had a 50's sock hop to celebrate, and we spent the day with Jackson at the Houston Museum of Natural Science. Both kiddos had a blast! 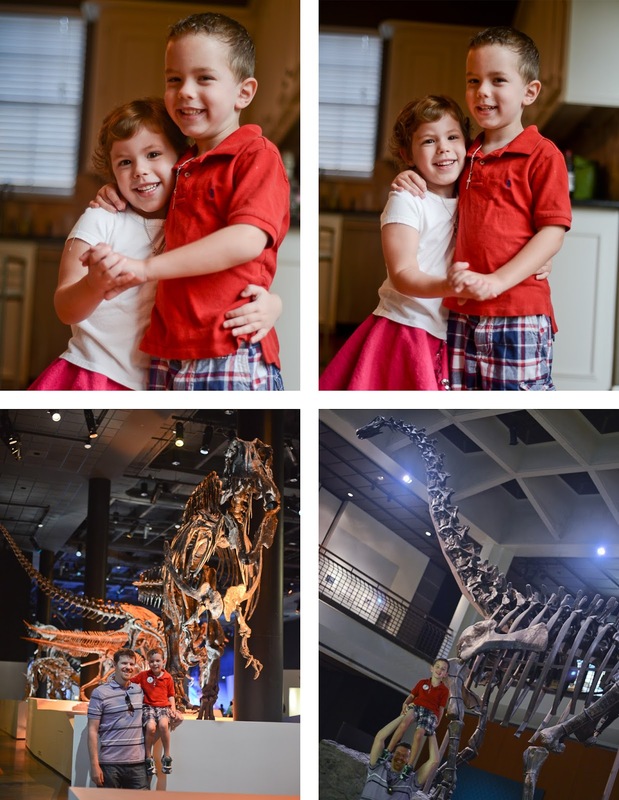 We gave Jackson several options for how to spend his last day of summer break, and his choice above the beach or riding rides or anything else was to go to the museum and a movie. Honestly, I was a little worried he wouldn't have as much fun at the museum, but he proved me wrong! He absolutely love every moment. There was so much excitement over each dinosaur and new discovery that he was exhausted when we were done, which made it the perfect time to relax and see a movie of his choice. We wrapped up the day with dinner as a family at a favorite restaurant. I couldn't have asked for a better last day of summer! Jackson chose to get baptized tonight, and he was blessed to be surrounded by family and friends for such a special occasion. There to celebrate with him along with me, Ross, and Audrey were Jackson's Nana, Pop, and Grandmother, as well as several close friends. Pastor Randy, who also prayed over Jackson at his baby dedication, was there to baptize Jackson today. 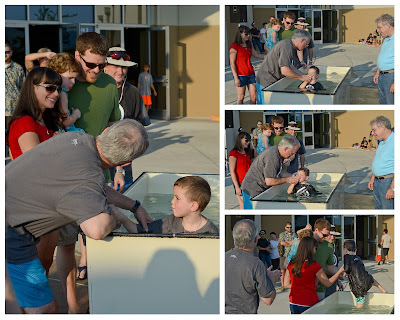 Last November Jackson prayed to ask Jesus to be his savior. I never imagined a 4 (now 5) year old could truly grasp what all of this means, but Jackson's desire to truly understand everything around him has resulted in a pretty amazing understanding of God. I am so grateful to know so many people are pouring God's love and grace into all of our lives. We have an amazing family, both church and relatives! After the baptisms were done, our church's family fun night began! 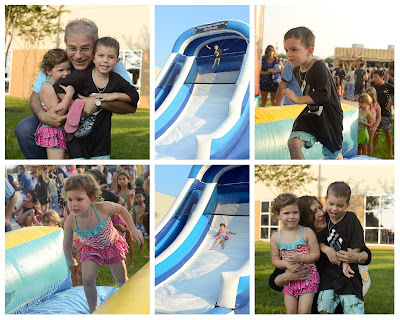 There were water slides and a grilled cheese food truck...can't beat that! The kids had a blast...at least until they stepped in a pile of ants. Here are a couple of individual shots I captured of Jackson and Audrey from the weekend too. I love these kids!!! There are a few more pictures in the album from this weekend.